As I left Chicago recently on Amtrak’s Capitol Limited, riding over former New York Central rails toward Cleveland on almost the same schedule as New York Central’s Lake Shore Limited, I ate dinner in the diner and then lay in my bed looking out the window at the lights of Northern Indiana and Ohio. Compared to the ad above, my train was, of course, at the other end of the line, but just as romantic a ride if you’re a rail lover. In bed I pondered the relative routes of the five railroads that in the streamliner era left Chicago for Cleveland or Pittsburgh. When I got home, I consulted maps in my Official Guides and consulted my editions of the Handy Atlas of American Railways. But the maps lacked enough detail, so I turned to the schedules. 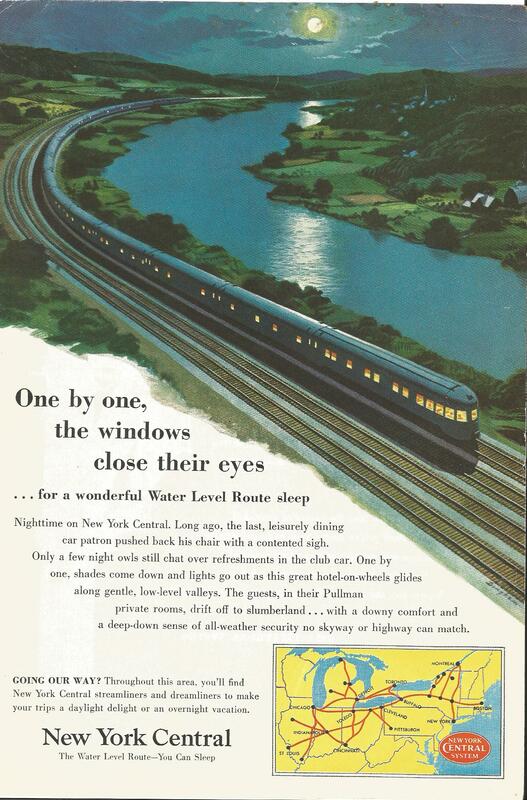 The most northerly of the five routes east to Cleveland or Pittsburgh was the New York Central, to Cleveland through South Bend and Toledo. Next most northerly was the B&O, through Akron and Youngstown. To the south of the B&O was the Pennsylvania and the Nickel Plate, both through Ft. Wayne; beyond Ft. Wayne, Nickel Plate went northerly, to eventually reach Cleveland. It crossed the B&O at Fostoria. The most southerly of the five was Erie, the only one that reached New York without passing through either Cleveland or Pittsburgh; it crossed the Pittsburgh-bound Pennsylvania line at Mansfield and crossed the Pittsburgh-bound B&O at Youngstown, and never needed to cross the Cleveland-bound Central and Nickel Plate. In Chicago, New York Central and Nickel Plate trains left La Salle Street Station, Pennsylvania used Union Station, B&O Grand Central, and Erie Dearborn. This entry was posted in Amtrak, Baltimore and Ohio, Chicago stations, Erie Railroad, New York Central, Nickel Plate, Pennsylvania. Bookmark the permalink.